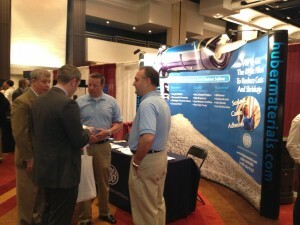 Thanks to attendees taking the time to meet us at our booth at the ASC Spring Expo in Atlanta. We thoroughly enjoyed meeting a number of great folks at the recent Adhesives & Sealants Council (ASC) Spring Expo held April 22 in Atlanta. Thanks to everyone who stopped by our booth to learn more about our high-performing ground calcium carbonate and barium sulfate products we offer for adhesives, caulks and sealants applications. We offer a number of Hubercarb®, Geotex® and Optifil® calcium carbonates and Huberbrite® barium sulfate that fuction as a rheology modifier, cost-reducing filler, tensile strength enhancer, toughening agent, opacifier and/or whiting agent. Learn more about our ground calcium carbonate and barium sulfate products today!